I have made a new frame for a set of 1″ chimes, so it made sense to extend the playing range up to the top G at this juncture. The frame has already been delivered, so now I have the time to make the bells. The first thing I need is an example bell, in this case I asked for the F. Not only does this enable me to take all the measurements that I need in order to make any parts, but it also helps during the tuning process so that the new bells fit within the existing set. 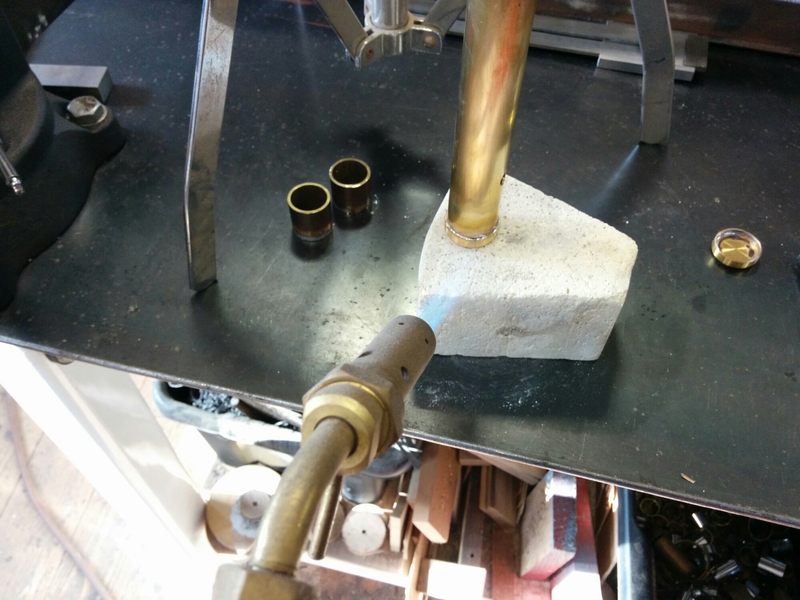 It is now virtually impossible to get brass tube in the size that I want, let alone the correct material. Brass is an alloy, so there are lots recipes to get the required properties for the desired application. Over time, brass is being replaced (presumably by plastic) so the commercial requirement for these mixes has largely disappeared. Combined with the mills being bought out during global monopolization, this has resulted in higher prices and less choice. Of course, if I buy sufficient quantity (a metric tonne) I can get whatever I want, but I am instrument maker – I make musical instruments for a living therefore I am poor; spending thousands of pounds sterling on lengths of brass tube is just not going to happen. 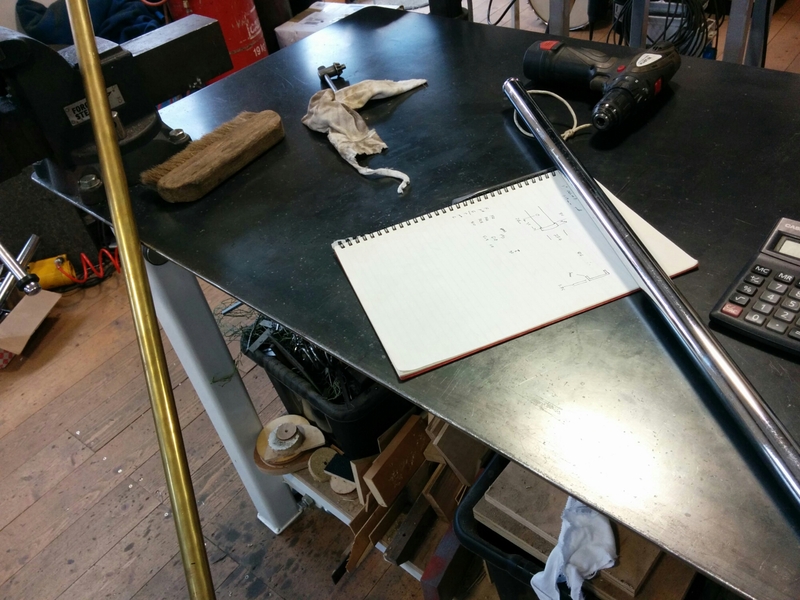 Additionally I would need four external diameters, and three wall thicknesses, that is twelve tons of brass tube! If I had that kind of money, I would retire to the Caribbean. Fortunately I do have some stock, which still equates to well over a thousand pounds just sitting on a shelf! In amongst those tubes I did indeed have a length of the correct material, which is the major hurdle negotiated. So the first job is to chop it into lengths longer than the bells I need to make. There is nothing worse than making a bell only to find that it is too sharp right at the end of the process when the tuning happens. With the two new tubes cut, I drill the holes for the string to match the existing bell and stamp the tubes. Using the existing bell as a reference, I measure the cap dimensions so that I can form the inside of the cap from solid bar. This form is then cut off the bar giving me two crude caps. I use a donor bit of tube offcut as a temporary bell and spot solder the caps in place. 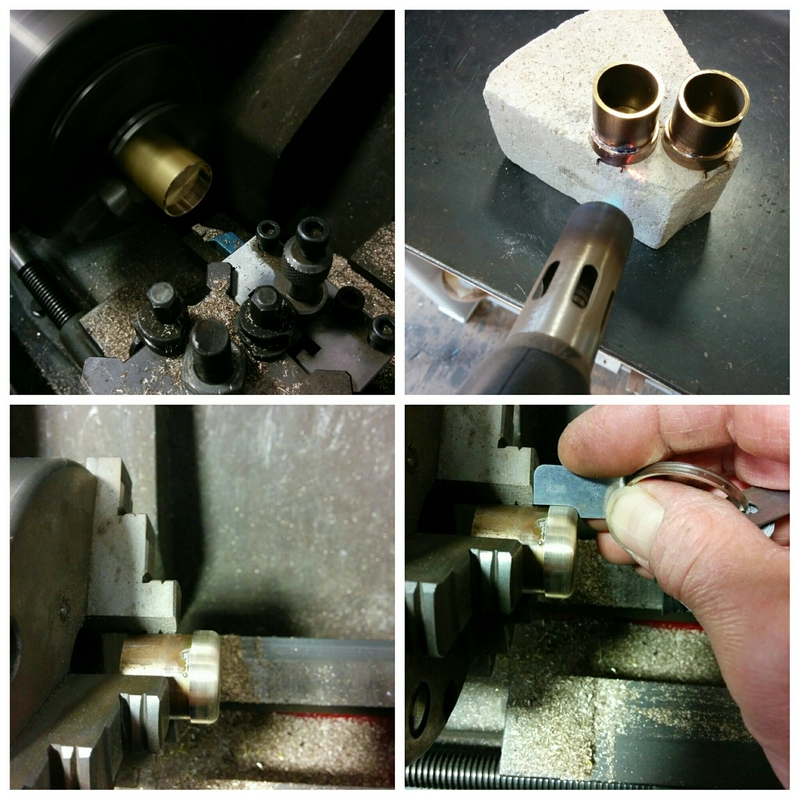 This enables me to hold the offcut tube in the lathe to form the external shape. My lathe doesn’t have a large enough bore to pass the tube through its headstock. With the caps now made, it is just a matter of removing them from the donor tubes and soldering them in place on the actual tubes. After they have cooled, I hand polish the whole bell, then tune it and send it off to be chrome plated if required. Thank you for your comment. It is difficult to understand exactly what you mean, whether you are making a statement or asking a question. Anything that you do to the bells will have affect the tuning, however removing the paint and cleaning off the verdigris will have a minimal effect on bells which are probably out of tune anyway. Should this happen – Do you know if anyone has tried adding a small weight to the non-capped end of the tube to lower the frequency slightly? Sshhhh! Don’t give all my secrets away! Sorry for the slow reply I have been away on holiday. First of all – don’t make the bells too short! It is a fact of life that notes of any description need to be tuned after all the work has been completed. This applies to xylophone or marimba bars as well as chromed glockenspiel bars or tubular bells. The unfortunate downside is that the finish, whether it be varnish, anodising, chrome plating, etc will be broken and moisture will be able to enter. 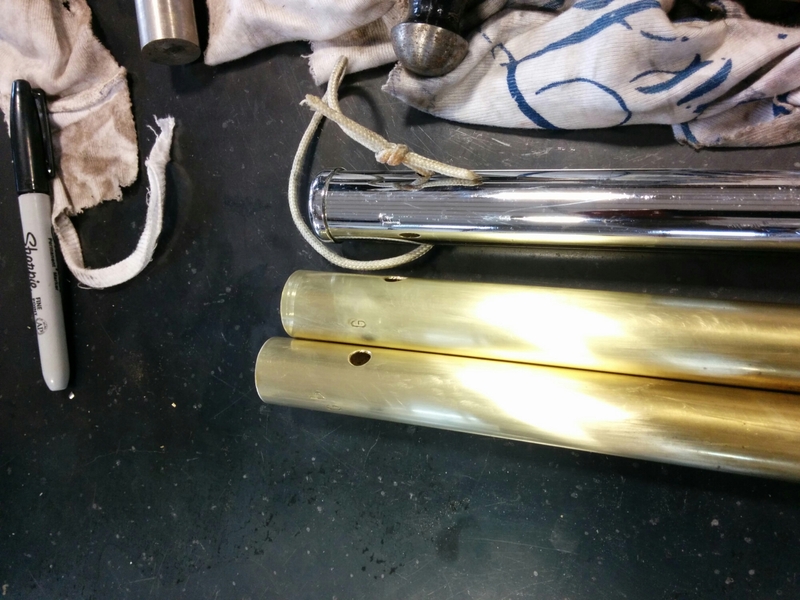 In the case of tubular bells, the bottom of the tubes need to be cut and this will mean that eventually the chrome will peel. Such is life. The bigger problem I find (other than school boy errors of making something the wrong size in the first place) is that the tuning process generates heat which affects the tuning. Therefore I often need a way of flattening pitches as well as sharpening them. I spend a great deal of my time experimenting with tuning of all things – that is my job after all and essentially all I am doing is playing around with flexibility and mass. So as tubular bells get shorter, they become less flexible so the pitch gets higher; therefore to lower the pitch I can either increase flexibility by increasing the length or say annealing the tube, or increase the mass. increasing the mass is best achieved at the open end of the tube for practical reasons. But as you have said, it is only good for minor changes.